Craftster Community > HOME SWEET HOME > Crafty Housewares: Completed Projects: Reconstructed (Moderator: LovelyMiss) > DVD Coasters - Easy fun cheap stocking stuffers for your movie lovers! DVD Coasters - Easy fun cheap stocking stuffers for your movie lovers! So I made this for my 12 Days of Christmas partner, and she's opened now, so I figured I would post. She likes movies, and so I thought I would make her a set of coasters! I used DVDs I picked up at the dollar store for this project. Ideally the next time I do this I will just be reusing/recyling DVDs that no longer work. 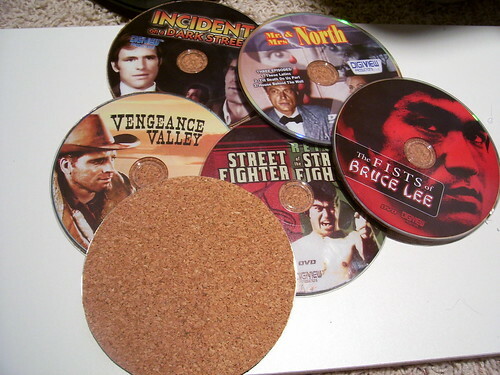 I used cork on the bottoms of them, and I used the non-skid plastic like quilters use on their rulers over the top of the DVDs to make them a little more glass-friendly. Also the next time I do this, I will be cutting out the center holes so that I can use a CD spindle as a coaster holder. Re: DVD Coasters - Easy fun cheap stocking stuffers for your movie lovers! I think it's a great idea! If I can find some cheap DVD's I might try them as a quick gift! What a great idea. And I love the idea of using the CD spindle as a coaster holder. What a wonderful idea! I wish I had thought of this before I threw away all those unwanted/scratched DVDs last month! Definitely bookmarking this! Awww! Thank you! I'm fairly certain I've never been bookmarked before! This is great! I wanted to make a few gifts for my husband this year and we have a bunch of really scratched up dvds that I didn't know what to do with! I think he'd like this a lot...and the dollar store dvds will be a fantastic addition since I don't have a whole lot already that I can use. Neat idea! Thanks!! I'm glad it'll be useful! To be honest, when I bought the DVD's at the dollar store I was afraid the discs themselves would be pretty plain, so I was fully prepared to have to print my own CD lables for them and make up my own movie titles. Luckily I was pleasantly surprised that the discs were all pretty visually interesting on these. I'm not familiar with the non-skid plastic you mention -- does it have a brand name? I found it sold by the roll at Joann's by the quilting notions. I don't have the package anymore, sorry. It's kind of the same feel as... do you remember color-forms? Kind of like that. I'll do some surfing to see if I can find more info. LOVE IT!! I'm also bookmarking it for my own "idea book". How did you cut the cork? Looking for those rubberband bracelets for causes! PM me!